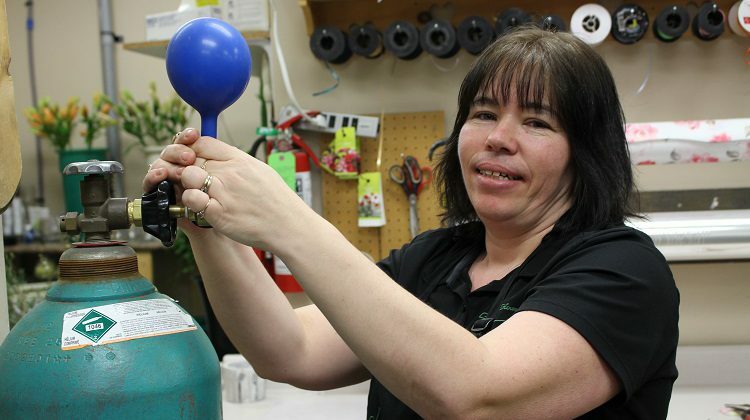 Timmins Flower Shop employee Denise Chiasson fills a balloon with helium. Thinking about visiting a party store to pick up helium balloons for a birthday or anniversary celebration? You might leave a little deflated. 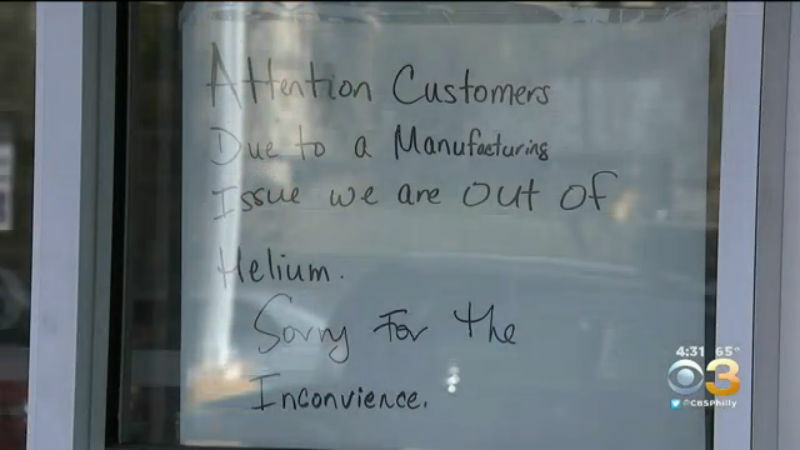 Helium is in short supply worldwide, forcing merchants to explain to puzzled customers that the lighter-than-air gas is not available. “The public does not know about the shortage at all,” said Jenna Gonsalves, whose family owns Dana’s Event Boutique & Florist in the Castro Valley Shopping Center. “They just don’t believe it.” As recently as early December, the store would have three helium tanks on hand, enough to fill roughly 500 balloons. But by New Year’s Eve the shop couldn’t meet the demand for inflated balloons, Gonsalves said, adding that “people were freaking out.” Today the business has only one tank. Unlike hydrogen, helium cannot be manufactured and can only be found deep underground. It’s also not renewable. 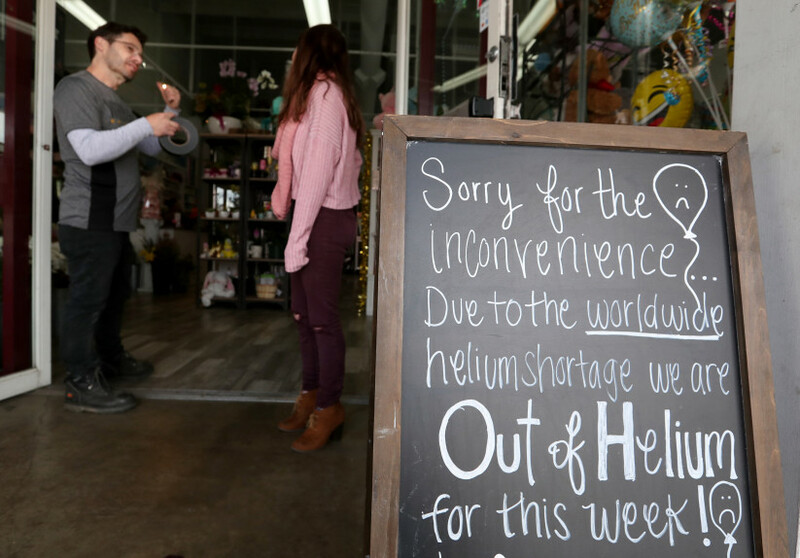 The last big shortage that left balloon stores scrambling happened in 2012, the result of maintenance issues at helium plants in Qatar, Algeria and Australia. That took the steam off the Fremont Fourth of July parade, grounding a 50-foot, bird-shaped balloon that was to have towered over the parade route. Much of the U.S. supply comes through a U.S. Bureau of Land Management facility near Amarillo, Texas. In 1996, Congress required the bureau to sell off its helium reserves and close the facility in 2013, which has contributed to the dwindling amount available, although the deadline was extended to September 2021. The goal of lawmakers was to get the government out of the industry and let private companies take over. “It’s a supply-and-demand issue,” said Jim Hermetet of American Gas Products, a company in Everett, Mass., that distributes helium and carbon dioxide throughout the United States. The need for helium in the space and medical industries is fueling the spike in demand, Hermetet said. The shortage likely will continue for at least three years, he said, when a plant is expected to open in Russia to help boost international availability. “There’s plenty of helium in the ground,” Hermetet said. “It’s just getting it out. That’s the problem.” Party City, a national chain with outlets in Richmond, Alameda, Union City, San Jose and other Bay Area locations, has put customers on notice that balloon orders may not get filled at some stores. ​”Currently, helium supply is very low while demand is growing,” the company said on its website, recommending people consider other options, such as using latex balloons filled with air. Customers can still purchase helium tanks and balloons online from Party City, however. Prices range from $44.99 to $70.99, not including tax or shipping. While balloons are perhaps the most popular use of helium, the colorless and odorless gas is also used in other ways, including in MRIs and imaging technology, as well as in lasers and scuba diving tanks. The shortage has left Hassen Almaweri, the owner of the Bay Party Store on MacArthur Boulevard in Oakland, especially frustrated. “If I don’t get helium, I will be out of business,” Almaweri said, adding that inflated balloons are the most popular items sold at his shop. Because of the shortage, helium prices have shot up. Tanks with up to 250 cubic feet of gas that a few months ago cost $100 can now run up to $400, Almaweri said. “Even if you can get a tank, you are not going to make any money,” he said. During peak times, such as Mother’s Day or graduation season, he likes to have six or seven tanks in the store to fill balloons. “Now you might only have one,” Almaweri said. Despite popular belief, helium is used for more than inhaling to make that temporary squeaky voice. Places where you’d normally get a bouquet of balloons are taking a hit because of a nationwide helium shortage. While helium makes balloons float into the air, the gas is taken from out of the ground. Don’t worry, you’re not constantly walking over helium. It can only be extracted from select places. So, when the supply is low in those few spots and the demand is high, a shortage can follow. On Party City’s website, there’s a disclaimer about the helium shortage and how it could affect supplies and orders. A Dollar Tree in York isn’t limiting the number of balloons you can get with the few tanks that they have. But they aren’t taking any future orders since there’s no telling when the shortage will let up. Even welding companies such as the Airgas store in central Pennsylvania is currently pausing their intake of helium customers. Helium is also used in the medical field and some aspects of engineering, so the shortage is affecting more than just local businesses. If you still have your heart set on balloons, air-filled balloons, twisted balloons, and balloon garlands do not need helium, according to Party City’s website.